Mancala is the term used for a family of board games that are extremely popular throughout Africa and some of Asia. Many people refer to Mancala as count and capture games with the term mancala meaning ‘to move’. In the West, mancala is most commonly found in the games Kalah, Omweso, Bao and Oware. The most common of these is Kalah, which is a game involving the strategy of picking up pieces and moving them. Each mancala game has different rules and strategies, but generally they share the same type of game play. The aim is to pick up ‘seeds’ from a hole and sow these seeds one at a time . This is known as the strategy and you must capture other holes based on the state of the board. 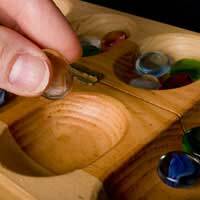 In order to actually play the game, you must have a mancala board of any type. You can buy these in various forms. Some traditional boards are made from wood or even stone, but all have similar holes in them so that you can move seeds around. The number of holes vary with each game and sometimes even within games. Mainly players will have control of one side of the board (on a two rank board), but during play they may make moves into each others side. If the game requires a four rank board, players will control an outer and inner row. This means that a players seeds will stay in the closest two rows to themselves until an opponent captures them. The basis of any mancala game is very straight-forward. To win you must capture more seeds than your rival. You can also attempt to leave your opponent with no possible moves, similar to check-mate in Chess. If you manage to empty your side of the mancala board first, this can also be a winning strategy. In order to play, each player my select a hole with seeds that will be moved around the board or ‘sown’. This movement mimics the actual skill of sowing seeds in fields, hence it’s origin. The player must choose holes on their side of the board normally and they then move all the seeds from a hole into subsequent holes around the board. This must travel in a wrapping motion around the board and can be played as a single lap game or a multiple lap game. A single lap game occurs when the sowing of seeds stops after dropping the last seed into a hole. In a multi-lap game the sowing continues and if the last seed lands in an occupied hole, all seeds in that hole are re-sown. This means that the game will continue until the seeds are sowed into an empty hole. In order to capture seeds from the board, a player must look at what the last hole sown was in a lap. Dependent on the game, the requirements for capturing a hole will vary. Most often, to capture seeds means you must end your turn in a hole with a certain number of seeds. Variations mean that you can also capture dependent on the number of seeds in any hole at a given time. Some games require you to capture the holes, rather than the seeds within them and this means that all seeds sown on a particular captured hole belongs to whichever player captured it during play.